I grew up in a part of London where there were many Greek Cypriots. My longest standing friend since the age of twelve is an aspiring West Country gent these days, but when we were kids I learned much of the magic of his Cypriot traditions and outlook. Easter time was always fantastic because I would often sleepwalk through the usual Anglican stuff and then get zapped with a slice of Greek Orthodox festivities a while later. This sometimes involved my mate’s dad Andy pouring us a whisky. It was all part of growing up. When the Cyprus war broke out in 1974 things got very worrying for my mate and his family. They lost all their ancestral lands and will never get them back. The war was precipitated by a coup promoted by the military dictatorship in Athens and the net result was a Turkish invasion on the pretext of defending their ethnic brothers who were largely in the north of the island. Greek and Turkish rivalries have never been far from the surface and it was always a mystery to me how the two countries could have so much fear and loathing for each other and yet be allies in NATO. People living in the UK attempted to get out to the island to join the battle. There is an apocryphal tale of one of my mate’s cousins being discreetly turned away from Heathrow Airport with a couple of Purdeys in his luggage. It makes for a good story but, as with the big conflicts the real story is in the countless personal tragedies. There were plenty. There had been a period when mainland Greece had dominated echelons of the island’s army but a change of tack in Nicosia brought this to a close at a most unfortunate juncture. Ferocious fighters, the Cypriots would have to stop the Turks pretty much all on their own with an array of weapons which were getting tired and creeping towards obsolescence. The bulk of their armour were elderly T34/85s backed up by even older Marmon-Herrington armoured cars and a good number of BTR-152 armoured personnel carriers. They would fight larger numbers of M-48 tanks and M113 APCs in addition to facing airborne assault. The result was predictable. In this interesting book Ionnis S Mamounidakis tells the history of the armoured units of Cyprus from inception to the period of its greatest trial. Images of home made improvised armour, including one vehicle made out of a turret-less Valentine tank which had been working in a quarry are great fun. He completes the book with a look at the armour in use today and backs the whole package up with personal accounts and a roll of honour. The photographs are generally very pleasing and there is a feel of immense pride and enthusiasm. The author is unabashed in his patriotism and does not mince his words. He talks of ethnic cleansing and other nightmares similar to later events in the Balkans. Despite these unpleasant realities I found the refreshing lack of political correctness acceptable. 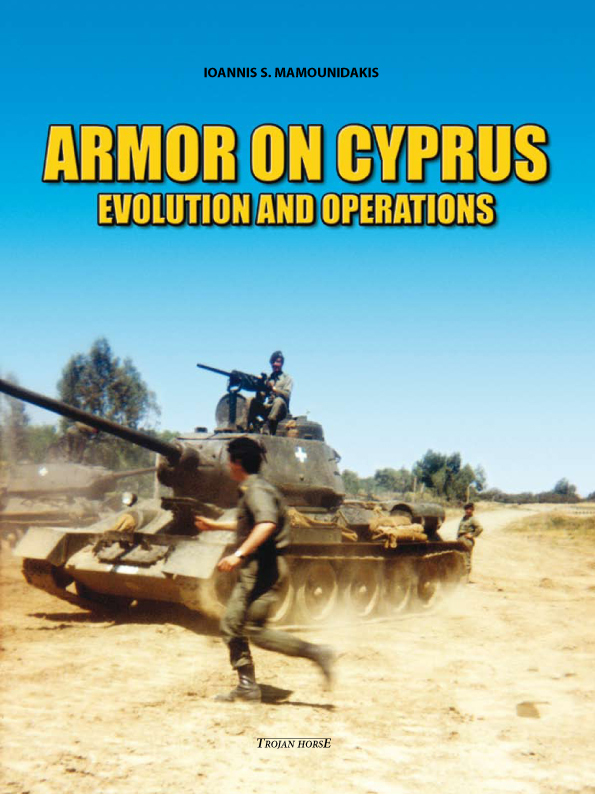 The book is about armour, not politics, and the aim is to fully explain the roles and equipment of mechanised forces in Cyprus. If you like your T34s then there is an important story of them here and I would suggest there is territory for model makers of Warsaw Pact kit seeking inspiration for something to draw them away from the Middle East and elsewhere. It is really pleasing to see something a bit different.